Desh 17th January 2019 Bengali Magazine pdf file. Desh- is the traditional Bangla literary magazine for cultural Bangalis readers. It is only one literary base Bengali fortnight edition magazine which has been publishing from Kolkata by Anand Bazar newspaper Group. And it prints out on the 2nd and 17th day of every month. Now I want to share a pdf file of Desh 17 January 2019 edition. 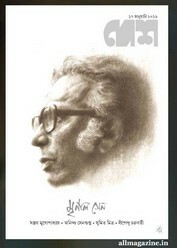 The cover stories of this issue are- about the film-maker Mrinal Sen (1923-2018), democracy in the state of Modi, remember- Dibyendu Palit and Pinaki Tagore, stories, poems, and many more topics. Desh Patrika's web site is desh.co.in. All readers could also collect all old issue of the Bangla Desh patrika. Collect the pdf. Dear readers can collect this current fortnightly issue- 'Desh 17th January 2019' in pdf.